The back-page headline is of a recognisable type: the question is, which type? The Post is understandably jubilant about the Mets’ series triumph over the Arizona Diamondbacks, but that doesn’t fully explain what it means by SWEEP SNAKES. As the team that lost all three games on their visit to New York, it wasn’t the Snakes that were doing the sweeping, as the headline implies: the Snakes were the ones being swept. So this could be one of two things. 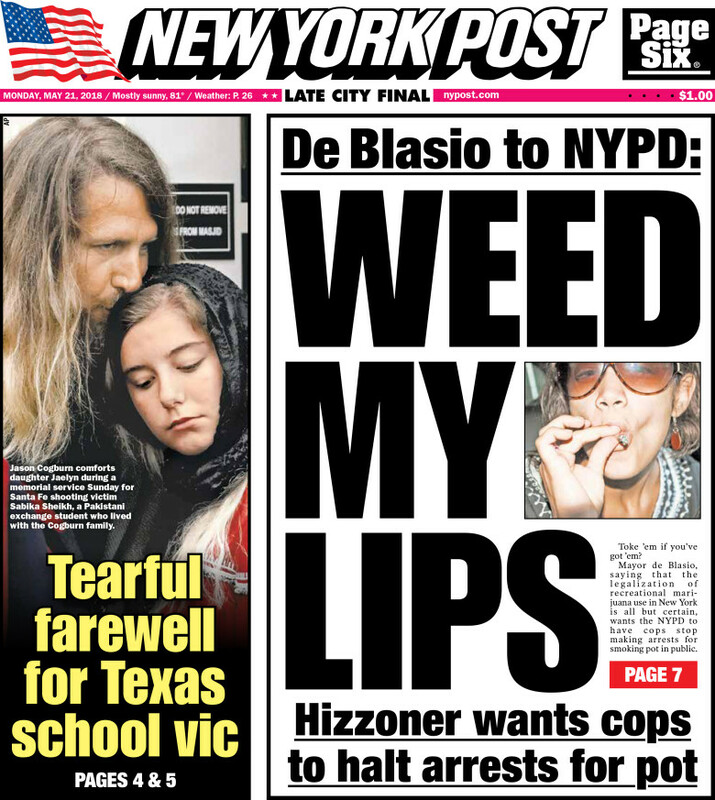 It could just be another unparseable tabloid pun (headline type 12): aspects of the story jammed together to create a homophonous phrase without too much attention paid to syntax. But the presence of a verb and an object along with the obvious absence of the subject, especially in an American publication, also entices one to think that it might be a flying verb (headline type 14): that the intended sentence is in fact METS SWEEP SNAKES. In the UK, the Sun also comes up with headlines very like this – ones that make more grammatical sense if you assume the subject is implied – but there’s no tradition of flying-verb constructions in Britain and the assumption in those cases has to be just that sense has been sacrificed in the pursuit of the joke. 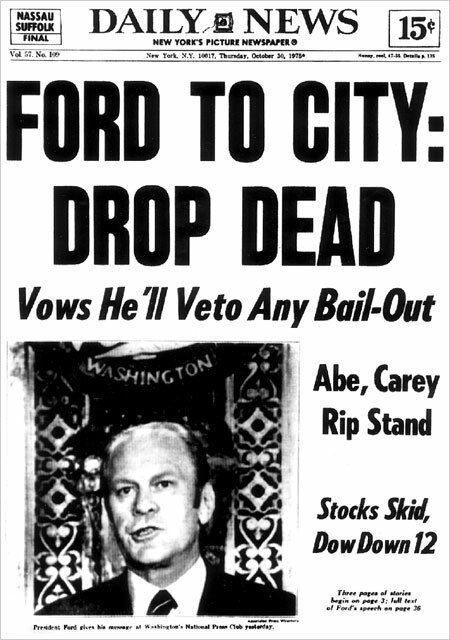 The original appeared in New York in 1975, when President Ford made a speech declining to approve federal assistance to the near-bankrupt city authorities, to the fury of the Daily News. As the New York Times remembers, FORD TO CITY: DROP DEAD was originally notorious for its perceived lack of fairness – was it really accurate to summarise the president’s words in such a belligerent way? Ford himself blamed it for his losing New York, and by extension the presidency, to Jimmy Carter in the following year’s election, even though by that stage he had relented and loaned the city money. But as a form, its rhetorical efficiency is so obvious that it has outlived its controversial origins and become a reliable construction in its own right. It’s not quite a voice-of-the-author (headline type 5) because it attempts to speak in the voice of the protagonist, rather than the writer. And it’s not quite an annotated quote (headline type 4) because the intent is clearly to editorialise the message rather than simply reproduce it. It therefore qualifies, I think, as an 18th type of headline, and the list will be updated accordingly. (A scant two weeks after being published. Still, I did say it was hubristic). 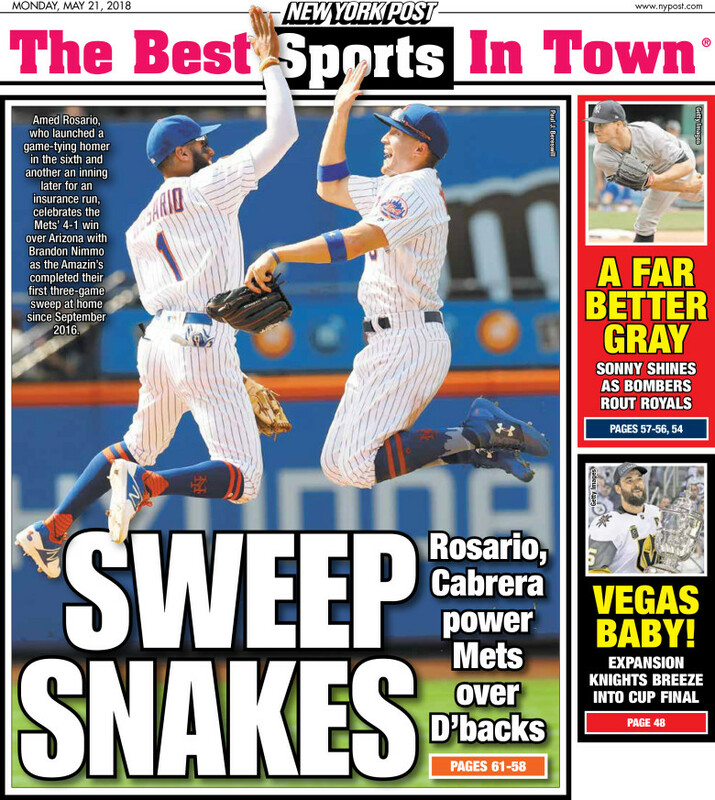 I think that the “Sweep Snakes” headline is indeed a flying-verb headline, with “Mets Sweep Snakes” being the intended meaning. Also, I suppose it’s a pun on “sweepstakes,” although I don’t see much connection between the World Series and a sweepstakes except that they are both something that somebody could win. Yes, it seems like puns just have to be a homophone – any homophone – without any particular relevance to the story these days!